Historic designs are amazing inspiration for all kinds of art. For my own beaded micro-macrame and bead-woven designs, I gravitate toward historic architecture and clothing to give me ideas of shapes and colors that will offer the right feel. While typical artist’s source books give some great ideas and templates for shapes, they can’t help much with colors. 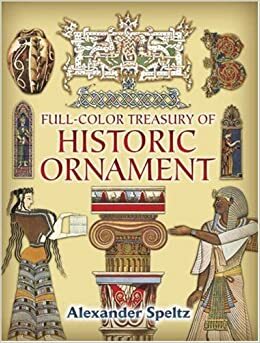 That’s where this Full Color Treasury of Historic Ornament, compiled by Alexander Speltz, finds its niche in my design collection. First off, this is not a comprehensive book – as with most such books from Dover Publications, it’s a curated collection of samples taken from a wide range of time periods and cultures. It includes ornamentation of all types, including sculptures, mosaic tile work, illuminated manuscripts, ancient drawings and paintings, and even textiles. After skimming the book, my husband made the comment that there are a lot of geometrics in here – and yes, there are LOTS of geometric patterns. They’re in different colors and configurations from a lot of different sources, and they’re exactly what I was looking for, so that’s a thumb’s up in my book. This book contains highlights from a huge three-volume set on historic ornament. Yes, it’s a lot less comprehensive than those volumes, but there’s still over 800 pictures to peruse in nearly 100 full-color plates. If you’re an artist, this is awesome lightweight eye candy while you’re planning new historically-inspired designs. For enthusiasts, this would make a great “coffee table” book to casually enjoy the features of various types of ornamentation. Note that this is not an informational book. There are no words except identifying captions at the bottom of each plate, which tells you when and where the illustrations come from. Finally – yes, they are illustrations, not photographs. Perhaps the only downside is that it is a limited color palette. I’m assuming that the limited color was for ease in printing so that they could keep the costs down, as is Dover’s hallmark. It’s a tiny drawback, but thankfully not a huge one for my purposes. If you’re looking at this book purely as an admirer of historic ornament, it actually lends a vintage feel that works very nicely with the content. As an artist, I employ a lot of source books to help me decide what to include in my next design. Beaded micro-macrame is so flexible that I can include a huge array of shapes, colors and textures into the mix, so all types of historic art are useful to me. While I don’t use the images as they are – though they are royalty-free – it’s one of my favorite references for specific patterns and color combinations. The reason why I love the geometrics is, quite frankly, because I needed a few new ways to use geometric patterns. Both on-loom and off-loom bead-weaving lend themselves to geometrics, and my past designs have done quite well when I’ve made them for sale – however, most of what I know is Native American art, and Plains Indians at that. I’ve even bought books on Native American design, which include North American Indian Designs for Artists and Craftspeople and Designs from Pre-Columbian Mexico. With this book, I got to take similar designs but totally different layouts and color schemes to create Egyptian, Greek and French designs with an ancient feel to them. Of all my design books, this is one of my absolute favorites and one that’s extremely well-suited to my purposes. That said, it’s important to know what you’re getting. If you want background on the pieces shown, for example, then you’ll be extremely disappointed with this book. If you want ready-made designs to render into new items, this isn’t the right book for that either. As design inspiration, it works quite well. Overall, this is a lightweight book that allows you to casually enjoy the ages of ornament from Ancient Egypt to the Renaissance. It is low-cost and well put together, so it’s an excellent addition to an artisan’s inspiration collection or as a quick reference for a history or design student. In fact, this is the very book that got me hooked on Dover Publications, which has since been responsible for my adding many, many books from this publisher to my collection.